For many high school seniors around the country, May 1 is Decision Day — the deadline to respond to college offers of admission for the coming academic year. It’s a big choice — one that comes with some equally big opportunities for the thousands of students who say “yes” to the University of California. For starters, UC undergrads get the chance to do hands-on research alongside faculty who are globally recognized leaders in their academic fields. In other words, UC students don’t just learn from their teachers, they get a chance to help faculty make new discoveries and advance knowledge. That breadth of research will be on display Thursday (April 20) as students from UC’s nine undergraduate campuses come together in Los Angeles at a showcase for alumni, donors, regents and other friends of UC. Aboulhosn has found that small electrical impulses in the heart dramatically increase in the minutes and hours before a heart attack. He’s used that information to create an algorithm that lets medical professionals zero in on these tiny signals. The methodology appears sound: Initial tests found a 73 percent accuracy rate in predicting cardiac arrest. And, the signals gave up to four hours of warning before an attack occurred. Eventually Aboulhosn’s algorithm could be used in bedside devices that save lives by letting doctors stop heart attacks before they occur. Alvelais works to advance solar technology, with an eye on producing cost-effective, scalable alternatives to what’s now on the market. She is helping to develop a new kind of solar cell structure, known as a nanopillar, that maximizes the absorption of light and minimizes reflection. These tiny structures could eventually prove more effective than existing silicon-based photovoltaics in efficiently converting light into electricity. Forget about using food stocks like corn or sugarcane to make biofuels. Anayah and research colleagues at the Joint BioEnergy Institute are focused on how to unlock the energy stored inside nonfood plant fibers. 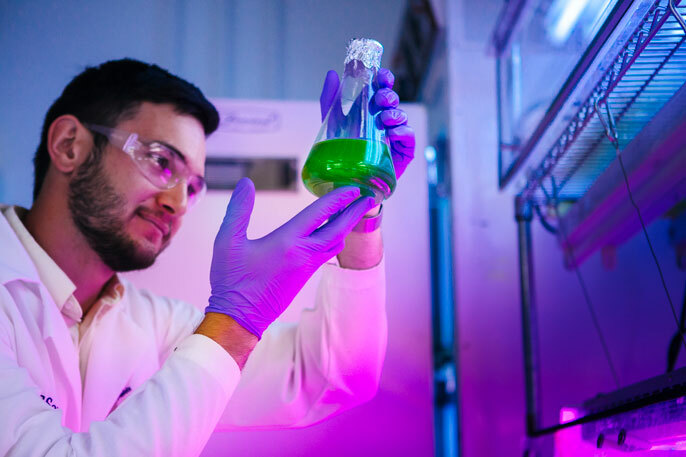 This kind of biomass is the most abundant organic material on earth, and Anayah is performing fundamental research to better understand how to program bacteria to synthesize energy-rich fuels from plant-based sugars. The ultimate goal: a carbon-neutral replacement for gasoline, diesel and jet fuel. Transportation is a basic, but often overlooked, issue. Low-income people are at greater risk for chronic illnesses, and a lack of transportation compounds the problem by making it harder to get to medical appointments. Au-Hong, in a study of the San Bernadino Free Clinic, is analyzing patient demographics and transportation barriers. Addressing the impact on health outcomes of intersecting dimensions of inequality, his research will be used to encourage city officials to prioritize trans.portation and other policies that enhance access to quality care. Research shows that community college honors programs are excellent pathways for helping students reach four-year institutions. But the literature doesn’t address how well these programs serve African Americans, Latinos and other underrepresented students. Barraza’s research looks to fill that gap. As a Latino and first-generation college student, Barraza’s research is motivated by both personal and academic interest. Baty has developed a mathematical model that simulates the physical changes that occur when weak shockwaves hit and travel through liquid mercury. Although Baty’s research focused on liquid mercury, the mathematical model that he used could provide a foundation for engineers, geophysicists and others who need to better understand how shockwaves affect various kinds of structures, including bridges and buildings. Baty has a strong interest in public policy and hopes to use his expertise in mathematics to help advise policymakers on technical subjects. With asthma at epidemic levels among children, Christensen looked at K-12 school districts in Orange and Riverside counties to see whether they followed asthma-safe cleaning methods. Few districts did, even when their own policies seemed to support it. She also looked at voter sentiment, and found evidence that legislation promoting asthma-safe cleaning practices in schools would likely have strong bipartisan backing. Fatal infections from antibiotic-resistant bacteria are on the rise around the globe. With new strains of drug-resistant bacteria emerging faster than we can create antibiotics, a different approach is urgently needed. One of the most promising lines of research concerns bacteriophages — viruses that kill bacterial cells with high specificity and efficiency. Dunn is searching for bacteriophages that can target some of the most difficult-to-treat bacteria in the age of antibiotic resistance. It’s been a decade since Sudden Oak Death began devastating forests across California and Oregon. Elgersma has been assessing the spread of the disease by sampling 2,200 tan oak trees on a forest ecology plot at UC Santa Cruz and comparing her findings to data that was collected when the epidemic began. Acorns from tan oaks make up half the diet of some mice species, and Elgersma’s preliminary research confirms that as tan oaks decline, these mice species do, too. Finegold is studying biomedical informatic visions of how precision medicine will lead to health and wealth in California, and the often hidden social justice elements of these imagined futures. Through qualita.tive analysis of key meetings where ideas of health, justice and biomedicine are being forged, and story mapping of the 3rd St. corridor in San Francisco, she is examining how biomedical advancements may inad.vertently play a role in aggravating health and social inequalities, and what might be done so that a more just biomedicine might become a goal of California’s investment in biomedical innovation. Ghaffari is part of the team investigating the recently discovered phenomenon known as Highly Superior Autobiographical Memory. Individuals with this rare ability can recall specific details of nearly every day of their lives going back to their early adolescent years. By studying this atypical and exceptional ability, Ghaffari and others hope to gain new insights into the neurobiological basis of memory. These studies may also provide clues to understanding neurodegenerative ailments such as Alzheimer’s disease. Transportation is the largest source of greenhouse gas emissions in California. Looking to reduce that impact, state regulators in 2010 began offering consumer rebates of up to $7,000 for the purchase or lease of a low-emission vehicle. But do these rebates translate into cleaner air? Green has been searching for answers by analyzing statistics from the rebate program, emissions data from the California Air Resources Board and consumer attitude surveys. Northern Elephant seal pups could provide important clues for advancing treatment of insulin resistance in humans. The marine mammals spend several months fasting every year, undergoing cellular and biochemical changes similar to those seen in obese people. Despite those changes, elephant seal metabolism remains steady. Juarez is looking at the mechanism that allows seals to maintain a healthy metabolism during severe fasts, to better understand insulin resistance in humans. Special education enrollment by students with autism spectrum disorders has quadrupled since 2000. Lau is helping to evaluate a technique known as Classroom Pivotal Response Teaching, which targets crucial areas of a child’s development to build motivation to learn, bridge social skill deficits, and decrease disruptive behaviors in the classroom setting. Lau assesses whether teachers use it correctly once they’ve been trained, and how well it works in both preschool and elementary school settings. Mancillas conducted 34 in-depth interviews with current and former gang members to capture their attitudes and beliefs about whether gang life puts them at high risk for an early, violent death. He found that traumatic experiences from gang violence, poverty and encounters with law enforcement contributed to a pervasive awareness and accommodation of early death that interviewees normalized in their daily lives — not unlike the acceptance one might find in a terminally ill patient. More than 36 million people around the world are infected with the HIV virus, in what is the worst pandemic of the modern era. Those who take a daily regimen of antiviral medications are now able to survive the infection, but they are never truly cured. That’s because reservoirs of dormant virus remain hidden inside cells, waiting to reactivate. Mume is researching novel approaches to suppress this latent HIV expression, thus eliminating the risk that the virus could reemerge. To meet the needs of the growing population, crop production will need to double by 2050. With the added stress of climate change, research is targeting ways to improve crop production. Nirmal’s research focuses on plant responses to drought and flooding, with the goal of improving crop tolerance to water stresses. Using novel gene-editing tools, she is also identifying genes which play a role in helping plants maintain their water levels. Chaparral covers about 5 percent of California, and is a key fuel source for wildfires. Sanpakit assisted in developing a model that firefighters can use to help anticipate how chaparral fires will behave. Using computational tools and a USDA Forest Service wind tunnel equipped with cameras and heat sensors, Sanpakit and his colleagues tested how chaparral fires change based on given variables such as wind velocity and fuel moisture. Among other findings: Higher wind velocity significantly enhances fire intensity and creates a far more destructive flame.